Microsoft has made a big leap with this latest version for the Apple Mac in many ways. Not only has it nearly reached feature parity (and cross compatibility) with the Mac counterparts to MS Word, Excel, and PowerPoint, but it has finally added the e-mail and scheduling client tasks that Mac business fans have been waiting years for, by including Outlook. Our Microsoft Office 2011 training course is designed to take you step by step through the MS Office. Interactive simulated exercises are included so the actual MAC version of the software is not required to participate in the course. MS Word for Mac 2011 is the latest version of Microsoft's word processing tool for the Apple platform. It offers a streamlined interface and features that allow you to create attractive and engaging documents. 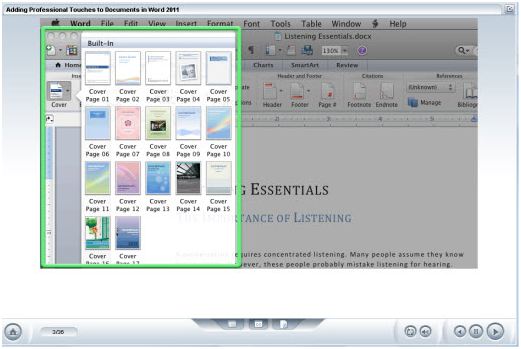 The ribbon, which is unique to Microsoft Office, organizes Word's many features into related tabs and makes it simpler to quickly access those you need. And if you don't want to start your document with a blank white page, you can easily choose from a variety of new templates using the Word Document Gallery. Our training course explores these topics and many other basics of using MS Word 2011, including opening the application , creating new documents, opening documents, basic text editing, and an introduction to the many tools that will help you create and edit your documents. Excel for Macintosh 2011 is the newest version of MS Office's comprehensive spreadsheet tool for Macintosh systems that offers features supporting a large range of data entry, formatting, organization, and analysis methods. The new look of the ribbon menu arranges the many features of Excel into related tabs, making it easy to quickly access the ones you need. The Workbook Gallery contains a variety of smartly appealing templates that simplify file creation by speeding up the styling and formatting processes, and often times adding useful features such as a Total row in a pre built Invoice template. Learn to explores these topics and many other basics of Excel, including opening the application, creating new spreadsheets , and entering data both manually and through Excel's automatic features. PowerPoint for 2011 MAC training teaches you all the tools necessary to create and present engaging and effective presentations on the Mac OS X platform. You will learn to use the graphical approach in the form of slide shows to create and deliver professional–looking presentations. PowerPoint also offers a variety of attractive templates and slide design options that you will learn to use to save you time and effort. These tutorials will equip you to create a basic presentation, either from scratch, using a pre-designed theme, or template. You will learn how to add and format text, as well as modify the structure of a presentation..